Are You In His Boat? 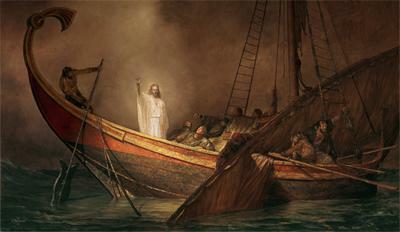 Are you missing the boat, within your Christian relationship with the Father, the Son and the Holy Spirit(2 Cor 13:14)? You see it is by God's free grace (Ephesians 2:8-9), by the shed blood of Jesus Christ (Hebrews 9:19-22),and the fellowship of the Holy Spirit (John 14:26), that we are what we are today. A redeemed and saved " Child of God" (Philippians 1:21). However, in today's "hurry-up and wait " society often times we tend to set God's Word aside, or maybe we just pick out a quick internet devotional, just to satisfy our ego(Proverbs 25:26). A confession ! I've been there and done that. Just how does this approach make our loving Heavenly Father feel? Can we really disappoint God? I think not, " Praise God"(Psalm 139:7-13). Like the old Christian tune says, " He knew us, yet He loved us"(Romans 8:38-39). Often times, we may forget that God created us and knew beforehand every decision (good or bad) we’d ever make( Jeremiah 1:5). And in knowing that, He still gave His Son to purchase our salvation; not because we were worthy, but because He loved us(1 John 4:19). You see, 2000 years ago, God foresaw every lie we would tell, He saw every mistake we would make and He knew every hiding place we would have. And He still gave His Son, Christ Jesus, to purchase our salvation(Romans 5:8). Sometimes we miss the boat by relying on a close friend, be them a believer or not,(Micah 7:5-6)for a quick answer to our problem rather than commit the problem to prayer( Hebrews 4:16). Conversely, making the scripture our utmost daily guide is the all inclusive measurement for our lives(2 Timothy 3:16). Not only should we read God's Word, but we should always allow God's Holy Spirit to "convict" and "comfort" us in our times of trouble or need(John 16:7-8). So why not make the decision today to welcome home your Heavenly Father, by committing daily to His Holy Word. What God says will forever trump what people say( Galatians 5:17). And I believe He’s saying that it’s time that we answer the knock outside the door of our heart( Revelation 3:20). It's time to invite Him in to help conquer this trying evil worlds philosophy (John 8:44)( 1 Timothy 4:5). So won't you jump on the boat and paddle your way to " VICTORY".